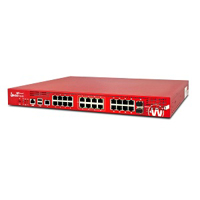 The WatchGuard Firebox M440 is a new mid-range appliance from WatchGuard that offers a wide multi-port configuration that is not available on other WatchGuard models. It includes 25 1 Gb ports and 2 SFP+ 10 Gb fiber ports with integrated switch that supports full layer 2 bridge between ports. Available with just LiveSecurity, as a NGFW, or with full UTM Security Suite the M440 is ideal for Small and Mid-size enterprises to use as a wireless controller, or in environments where there are many VoIP accessories. WatchGuard Firebox M440 with 1 year Security Suite including WebBlocker, Application Control, spamBlocker, Gateway AntiVirus, IPS and Reputation Enabled Defence. WatchGuard Firebox M440 with 1 year Total Security Suite including WebBlocker, Application Control, spamBlocker, Gateway AntiVirus, IPS, Reputation Enabled Defence, Data Loss Prevention (DLP), Dimension Command, APT Blocker, DNSWatch, Threat Detection and Response, and Gold Support. WatchGuard Firebox M440 including 1 year LiveSecurity, providing software updates, technical support and device warranty with advance hardware replacement. WatchGuard Firebox M440 including 3 years LiveSecurity, providing software updates, technical support and device warranty with advance hardware replacement. WatchGuard Firebox M440 with 3 year Security Suite including WebBlocker, Application Control, spamBlocker, Gateway AntiVirus, IPS and Reputation Enabled Defence. WatchGuard Firebox M440 with 3 year Total Security Suite including WebBlocker, Application Control, spamBlocker, Gateway AntiVirus, IPS, Reputation Enabled Defence, Data Loss Prevention (DLP), Dimension Command, APT Blocker, DNSWatch, Threat Detection and Response, and Gold Support. WatchGuard Firebox M440 High Availability with 1 year LiveSecurity for redundancy in an active/passive setup. WatchGuard Firebox M440 High Availability with 3 years LiveSecurity for redundancy in an active/passive setup.